Join us for our First Friday in December! We invite you to come and celebrate the season with us, bring you friends and family to enjoy the joys of Christmas inside our showroom! Refreshments will be provided along with sweet Christmas songs sung by Kendall Cudd, plus a photo opportunity in our beautifully decorated living room. Join us for First Friday in November as we host the Craft & Farmer’s Market inside the Showroom. The aroma of pumpkin and spice will fill the air, and crafts galore will get you in the mood for shopping. An evening filled with vendors, live music and as always complimentary snacks & beverages. Sip on Hot Cider and shop with our local vendors. Join us for First Friday events! 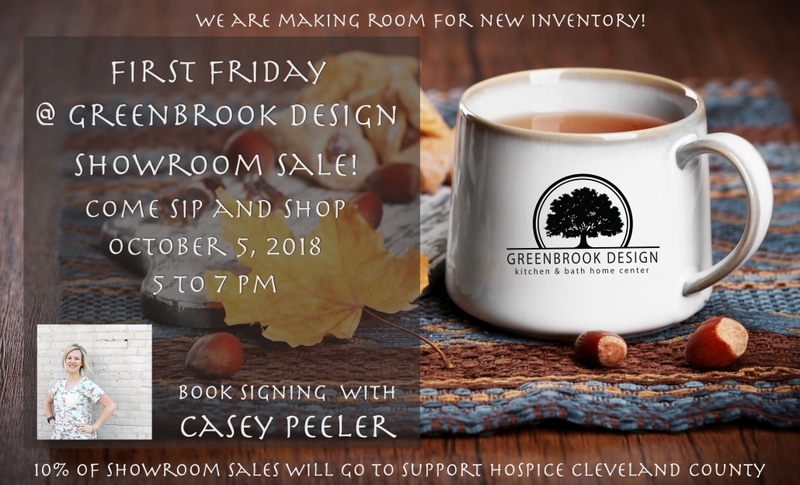 In association with the Cleveland County Chamber, we are proud to host Business After Hours and Open House at Greenbrook Design Center. Come experience southern hospitality in our showroom with live cooking demonstrations and live music. We invite you to tour our showroom, see all the possibilities and new products we have to offer for your home or office. Take advantage of the networking oppotunities that Business After Hours offers. Come celebrate everything HOME with us! 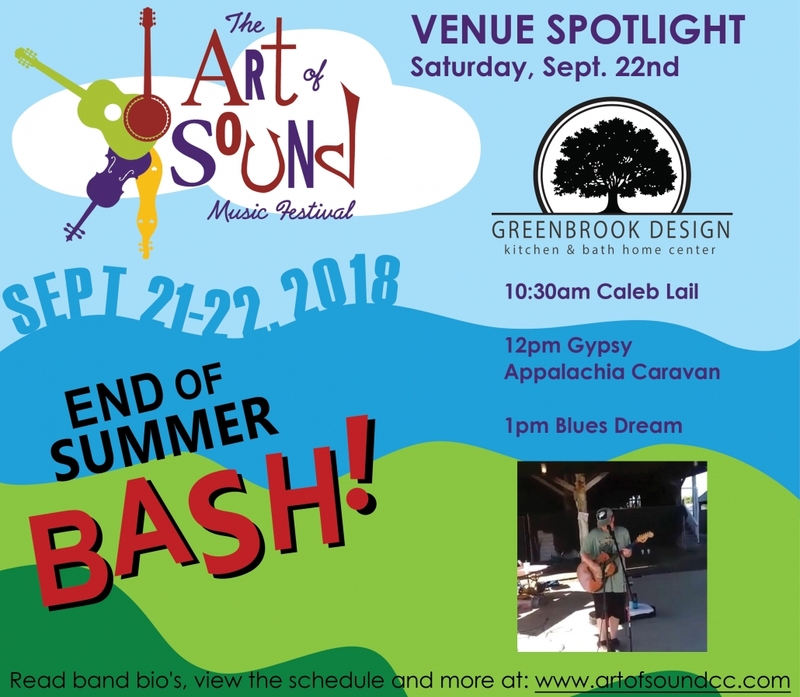 Greenbrook Design is one of the many host locations to offer FREE music throughout the day! This is our first year to participate in this event. 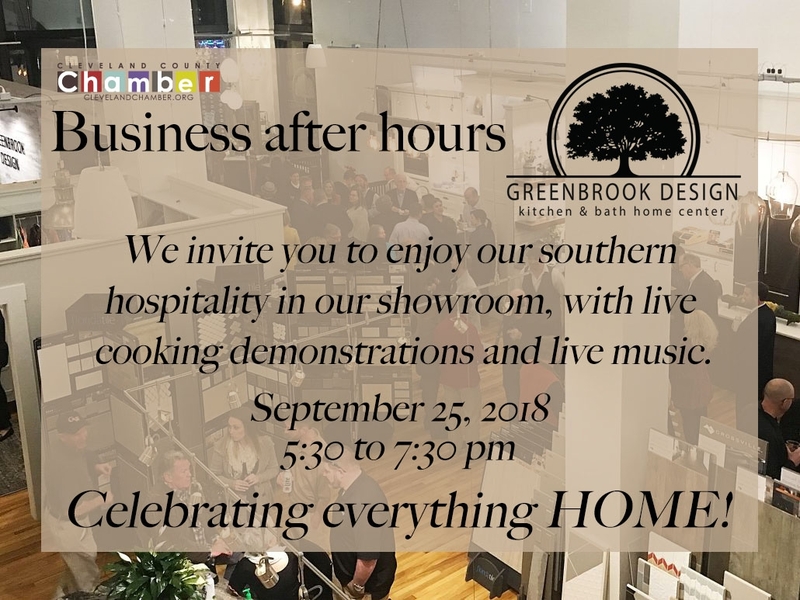 We will have 3 musicians playing inside or possibly outside (weather permitting) of the Greenbrook Design Showroom located at 112 N. Lafayette St. Shelby, NC. New to Shelby or not sure what the Art of Sound is? The festival begins Friday September 21 and continues through Saturday September 22, 2018. Art of Sound is a music festival by and for music lovers of the arts and music. It has the feel of a weekend concert series. The festival serves as a gift to the community and is FREE! In an effort to not only support the local musicians, we also encourage you to dine at the many fine eating establishments in Uptown Shelby. A full schedule of events can be seen here. Greenbrook Design Showroom is the host location for this very informative college presentation. 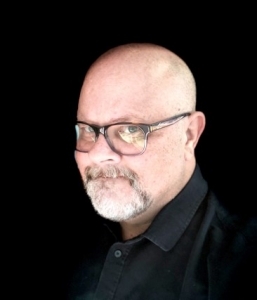 The Tutor Doctor will talk about practical strategies to address admission questions and find out what colleges are looking for. This program will address students’ big admissions questions. Parents and students are both welcome, but space is limited. Snacks will be served. 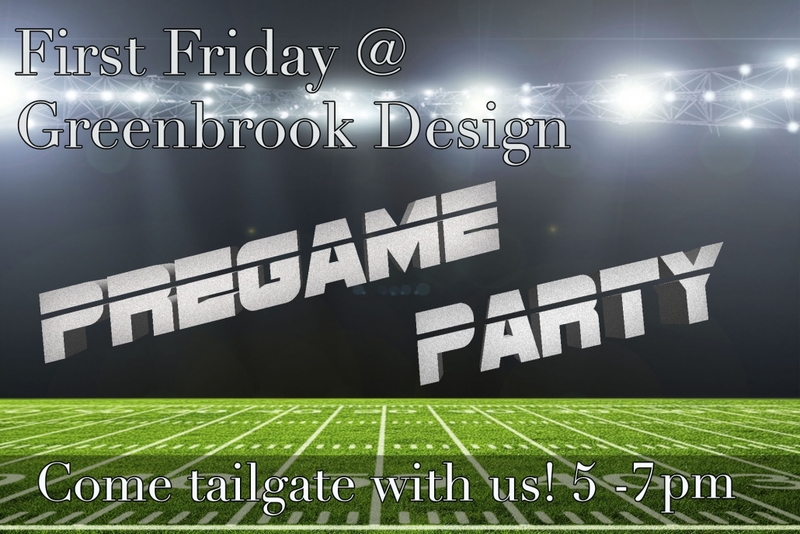 Join us for First Friday – September 7th at Greenbrook Design our theme is “Pre Game Party – Friday Night Lights”. Typical tailgate foods and beverages served. We encourage you to represent your favorite team! A shopping bonus: Peace Avenue will be here with all your local team spirit shirts for sale. 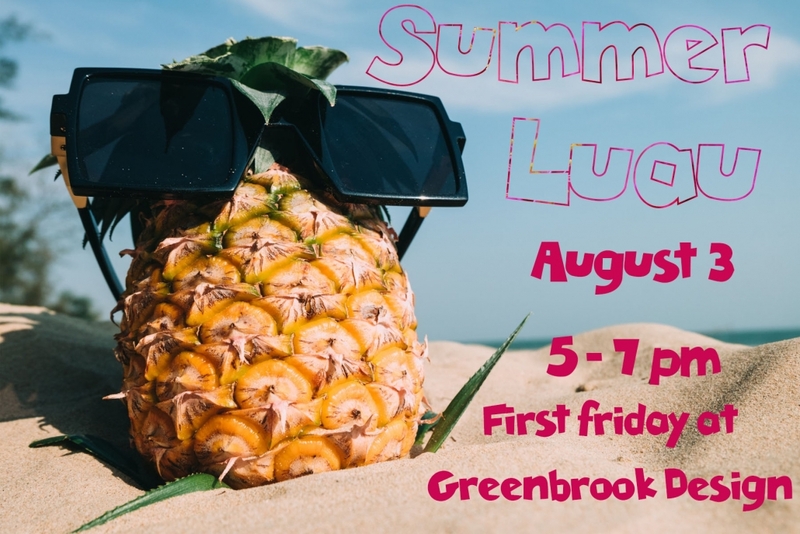 Join us for First Friday – August 3rd at Greenbrook Design and our theme is “Summer Luau”. 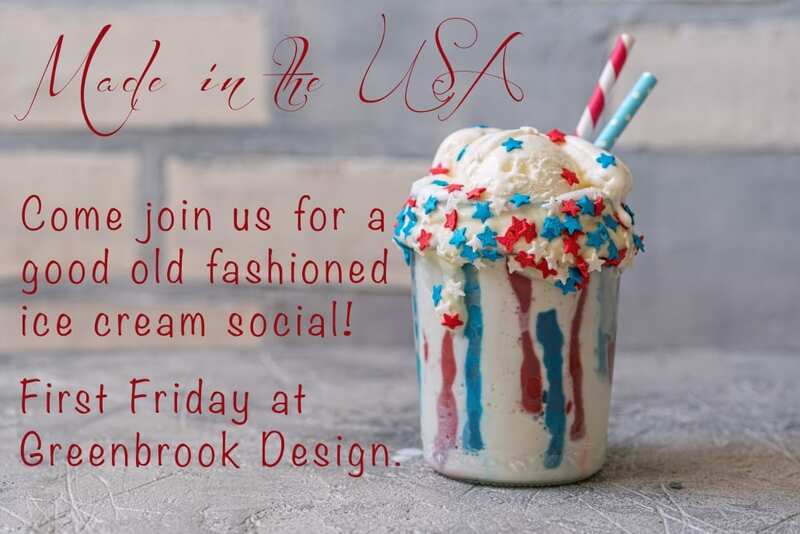 Join us for First Friday – July 6th at Greenbrook Design and our theme is “Made in the USA”. We will be celebrating with a good, old-fashioned ice cream social supplied by Uptown Sweets and Treats. Music will be provided by “Vintage Vibe” featuring Danny Scruggs and Crystal Prough. 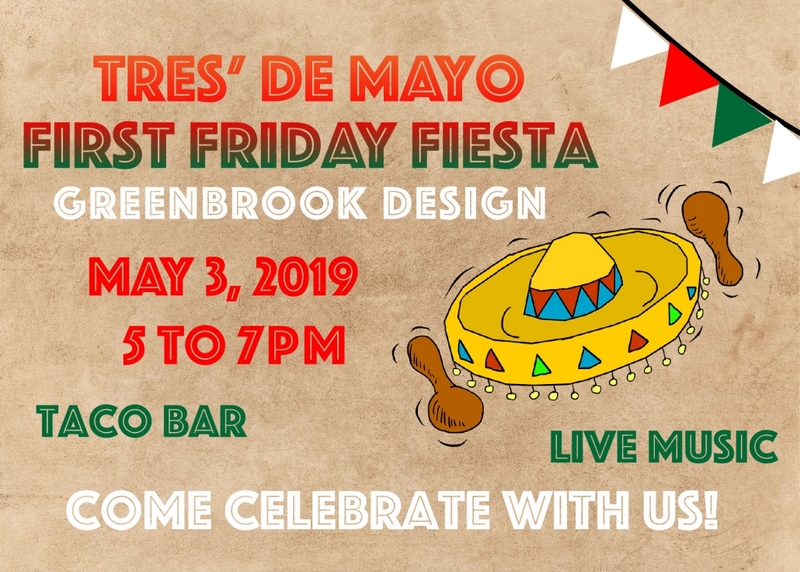 Bring the whole family and enjoy the casual setting of the Greenbrook Design Center while eating America’s favorite frozen dessert and listening to music! Dallied – yard art, wind chimes and candy! Workshop Shelby – Come see Wren! 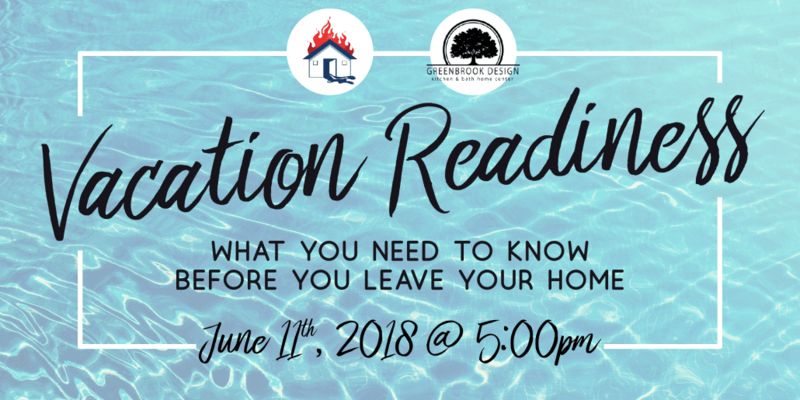 Join us for a VACATION READINESS presentation and learn 3 essential tips you must know before leaving your home. Do you know the most common forms of water damage? And the destruction that can occur while you are away? 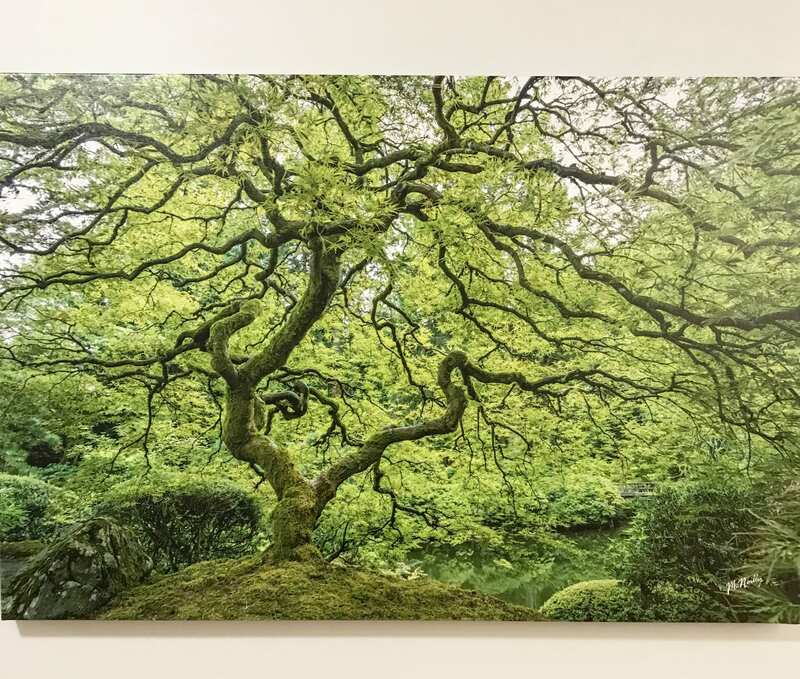 Join us for First Friday – June 1st at Greenbrook Design. Our theme for First Friday in June is “Sweet Sweet Summertime”. We will be celebrating teachers as they get more excited about summertime than the average person! We will have over 10 vendors, door prizes and entertainment for everyone to enjoy! All ages are welcome! Most vendors accept credit cards, but some are cash only. 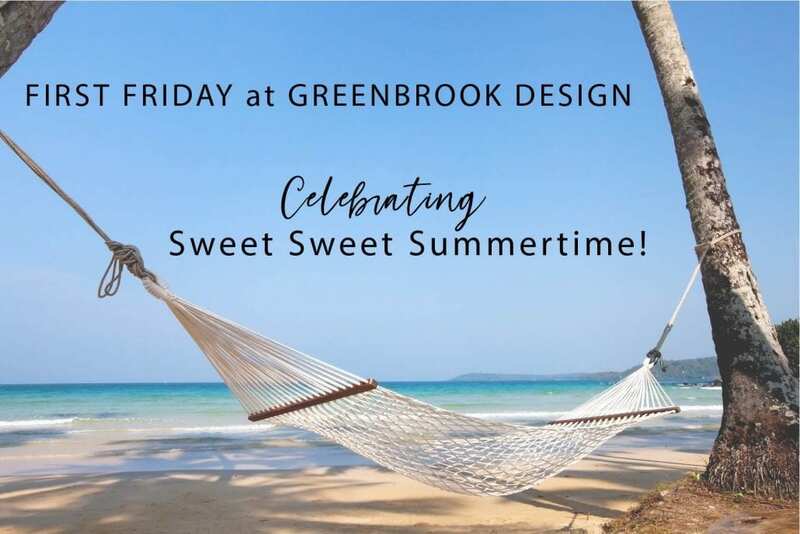 Enjoy a sip of summertime lemonade, complimentary adult beverages, and shop with all of our local vendors in the casual setting of the Greenbrook Design Center. Bring a friend, we have FUN! 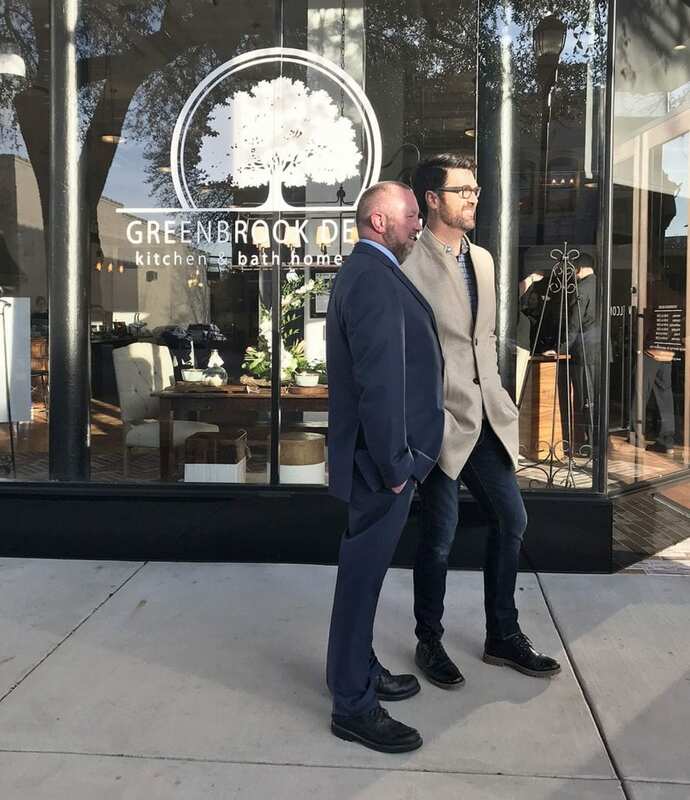 JARON STROM VISITS GREENBROOK DESIGN! 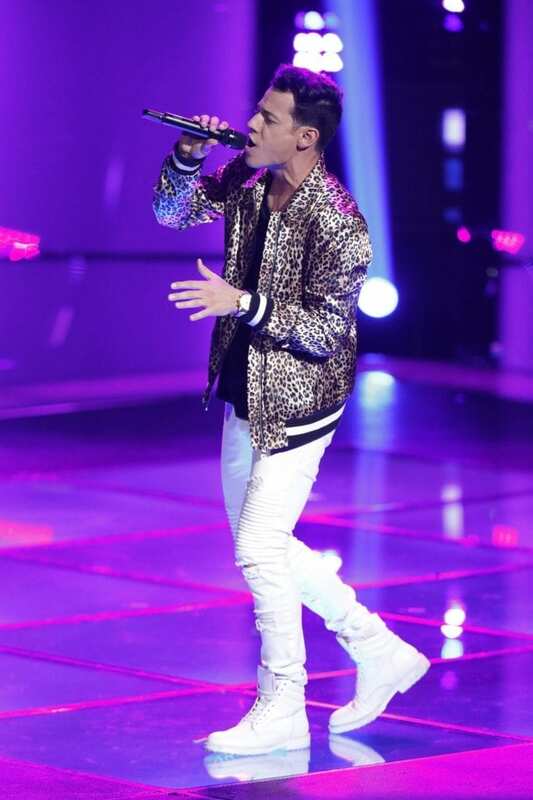 We are excited to have local artist Jaron Strom, a contestant from The Voice, visiting with us for a special performance and photo opportunity. Light refreshments served while you enjoy the music and visiting our showroom. Woody Padgett with Future Energy & The Big Green Egg will have samples hot off the grill for you to taste. First Friday is the first Friday of each month in Uptown Shelby. Come out and support local businesses! There is entertainment, shopping, dining and more to see in Uptown Shelby! 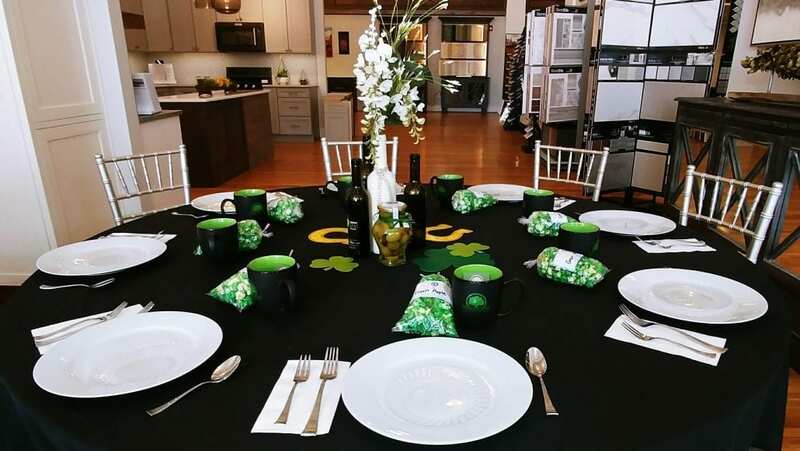 You are invited to celebrate the luck of the Irish at Greenbrook Design – Shelby, NC. 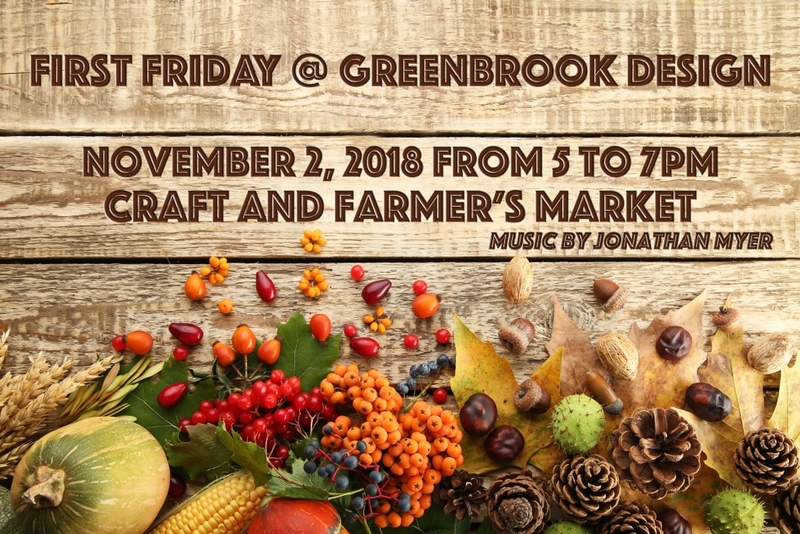 Greenbrook Design along with Uptown Olive & Oil invite you to join us for a demonstration and sampling of Soups & Salads! Seating is limited! Click the button for more information. 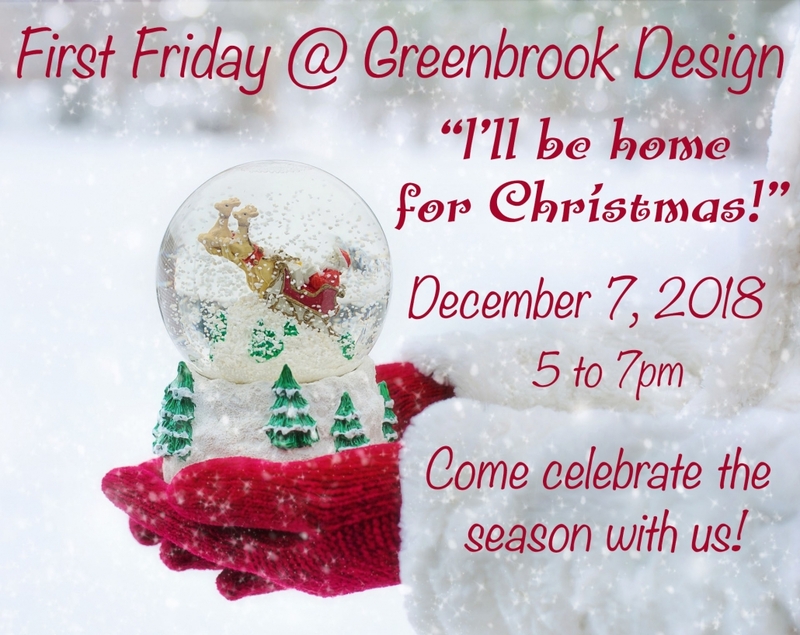 We invite you to join and start your weekend with us at Greenbrook Design! First Friday ~ Art March at Greenbrook Design! The public is welcome to see beautiful art displays in our showroom and also purchase art. Browse in the casual setting of our showroom, meet friends and family here! We have a variety of local artist. We are excited about our first – First Friday event in Uptown Shelby. Come out and support local artist and business! There is entertainment, shopping, dining and more in Uptown Shelby! This was an amazing celebration with special Guest Brian Patrick Flynn! To have witnessed our community join together at the cause of this event excites me for the future of Greenbrook Design Center! These folks are the drive behind our passion. And by community, I want to iterate. That’s Shelby, North Carolina and Cleveland County, but also our community of designers, contractors, business associates and clients, both local and afar. We are a community of support and innovative design. Check out the video link for more!